By embedding a nano-sized transistor inside a cell-like membrane, scientists link humans and machines more intimately than ever. An artist’s representation of a new transistor that's contained within a cell-like membrane. 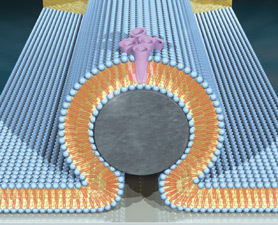 In the core of the device is a silicon nanowire (grey), covered with a lipid bilayer (blue). Man and machine can now be linked more intimately than ever, according to a new article in the journal ACS Nano Letters. Scientists have embedded a nano-sized transistor inside a cell-like membrane and powered it using the cell's own fuel. Scott Dougherty, LLNL. The research could lead to new types of man-machine interactions where embedded devices could relay information about the inner workings of disease-related proteins inside the cell membrane, and eventually lead to new ways to read, and even influence, brain or nerve cells.